Screen capture from “About Us” page of U-T San Diego website. The U-T San Diego newspaper was sold Thursday to Tribune Publishing, owner of the Los Angeles Times, for $85 million. The sale was announced in a breaking-news email alert from the San Diego newspaper. It ends 146 years of private ownership of the newspaper. The U-T’s current owner, “Papa” Doug Manchester, would retain ownership of the company’s Mission Valley property, where he is seeking city approval to build 200 luxury apartments. 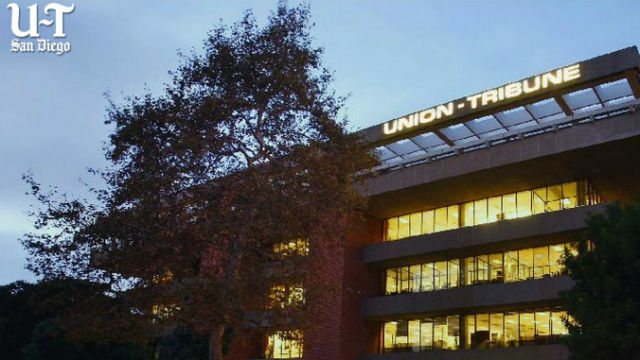 The U-T would operate under a short-term lease. Austin Beutner, the Times’ publisher and chief executive, will hold those posts at both companies after the deal closes. He said the U-T would continue to operate as a separate brand with a separate newsroom. U-T President and Editor Jeff Light will remain with the company. He was quoted as saying the combination of the two newspapers creates a unique opportunity. “The business opportunity, and the journalistic opportunity, is very big,” he said. The Los Angeles Times has a print circulation of 629,000 daily and 945,000 on Sunday. U-T San Diego’s most recent circulation numbers are 183,000 daily and is 268,000 on Sunday. It has been reported for about a year that Manchester has been looking to sell San Diego’s major daily newspaper, and Tribune emerged as the most likely buyer. Manchester, a real estate developer and hotel owner, purchased the paper four years ago. He later acquired the North County Times and a group of community newspapers and folded them into U-T San Diego operations. It’s been reported for about a year that Manchester has been looking to sell San Diego’s major daily newspaper, and Tribune had emerged recently as the most likely buyer. A bid by U-T San Diego to start a 24-7 television news operation proved to be unsuccessful, though the newspaper still produces individual video news reports. Tribune Publishing also agreed to assume U-T San Diego’s pension liability, which a report by Harvard University’s Nieman Journalism Lab estimated to be about $100 million. The report did say the sale does not include U-T San Diego’s Mission Valley headquarters. Before the sale, Tribune Publishing had eight metropolitan dailies, making it the fourth-largest newspaper chain in the U.S. However, revenues in the company’s most recent quarter fell 4.9 percent, according to Ken Doctor, who covers the business of journalism. He said most people won’t notice the changes.